Don’t expect too many fireworks at the box office this weekend. While the film world’s eyes will be turned to the Great White North for the Toronto International Film Festival, only one new release will be looking to make an impact. But will it? Here’s our prediction. 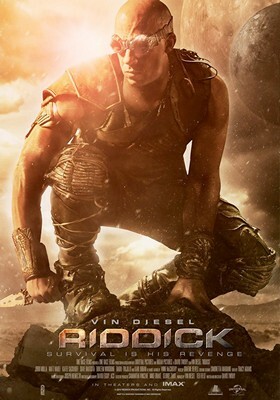 Riddick reunites Vin Diesel and director David Twohy, the two men behind Pitch Black and The Chronicles of Riddick, the former which has a huge cult following, the latter, not so much. However, there’s been a solid demand for the further adventures of the character, and buzz is high for Riddick’s return. It’s also worth noting that former WWE star and future Guardian of the Galaxy Dave Bautista has a significant role in the film, which could help its numbers this weekend. Look for a first place finish for Riddick with $25 million. Find out how the rest of the weekend will turn out after the jump! As for the rest of the top five, it should be fairly status quo. Look for Lee Daniels’ The Butler to grab second place with $9 million. We’re The Millers will hit third place with $7 million, while One Direction: This Is Us will drop hard to fourth place with $6.5 million. Planes will close things out in fifth with $4 million.